Are you looking for embroidered workwear bundles? Click here. What is Embroidery used for? Embroidery can be used for a whole host of material items and garments. It is commonly chosen for workwear and school uniforms due to its hard-wearing nature. As well as the personalisation of more common clothing garments such as Polo-Shirts, T-Shirts, Hoodies and Sweatshirts etc we use it to customise baseball caps, bags, towels, ties and martial arts belts. Embroidery offers an established and professional looking solution for your branding. Embroidery is a popular choice due to its appearance and hardwearing qualities. It can be used on most garments, washed at high temperatures and tumbled dried with no problems. Nowadays embroidery is carried out by computerised machines specially programmed to stitch out your logo or design. To be able to embroider your logo it must firstly be digitised or turned into a code that can be read by the embroidery machine. The digitisation process incurs a one off cost to convert your logo or design which we then store for any future orders. By paying this one off fee all individual garments work out cheaper including future orders. At Loopy Parrot we have our customers needs at heart. We have 4 individual embroidery heads meaning we can get large orders completed more quickly but also run up to 4 different jobs at any one time, speeding up the waiting time for customers wanting smaller orders. 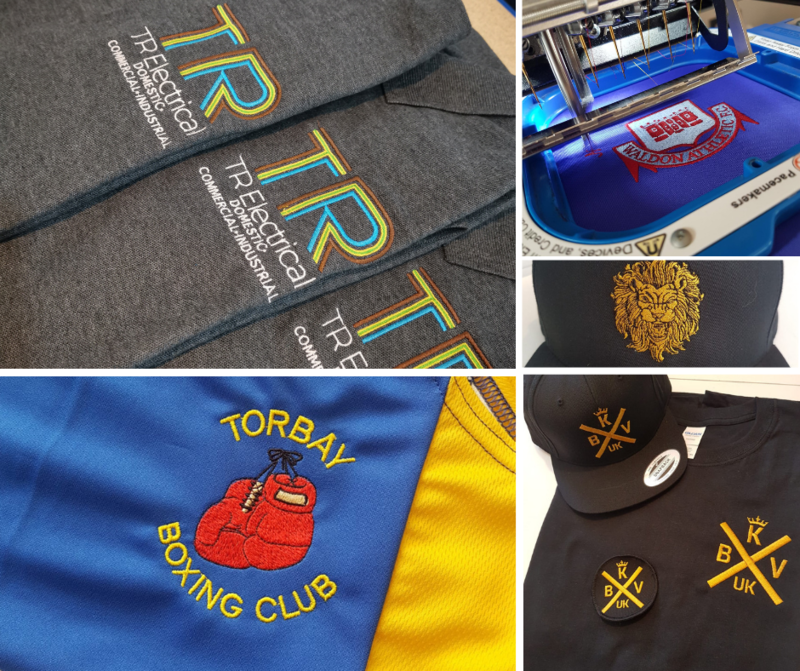 Loopy Parrot have sourced machines with the capability of embroidering up to 16 colours so that we are able to embroider even the most colour detailed logos and therefore offer something that not all companies can. Loopy Parrot stock 1000s of different coloured threads so we can match the stitching to your branding. We have no minimum order quantities so you can get only the items you need. If you have any questions about embroidery contact us here. Based in Torquay we provide services to customers throughout Torbay, Devon and the UK. We are here for all your print and embroidery needs for Embroidery, Screen Printing, Direct to Garment Printing and Garment Vinyl Application. Offering print on demand services for clubs and bands, as well as a white label service for individuals or businesses, that want to increase the products they sell to their customers.